Intravesical foreign body is a real challenge to the urologists. Different types of foreign bodies have been removed from the urinary bladder, which include electricwire, safetypin, hairclip, intrauterine contraceptive device (IUCD), gauze pieces, battery, leech, hairballs and so on. ,,,,,,, The causes include self-introduction of the material through the urethra to get sexual gratification, accidental migration through the urethra, or ia­trogenic-introduction. Usually, patients come for medical advice late after self-introduction of the foreign body in the bladder. In most of the ca­ses, patients present with pain in the lower abdomen, hematuria and cystitis. We aim in this study to report our experience with this medical problem and demonstrate the clinical presentation of the foreign bodies, their nature, and methods used to remove them. In this retrospective study, all the patients admitted with intravesical foreign bodies from February 2007 to January 2009 were included. Totally, nine such cases were admitted in our institute during that period. After admission, all the patients were evaluated with case history, clinical examination, ultrasonography (USG) of abdomen, plain X-ray of KUB area, routine blood biochemistry and complete blood count. Every patient underwent cystoscopy under gene­ral anesthesia for direct visualization of the fo­reign body within the urinary bladder and cys­toscopic removal of the foreign body is attemp­ted. If cystoscopic removal failed, then open cystostomy would be performed to remove it. The patients were discharged after 24 hours of the endoscopic removal of foreign body and 72 hours after open cystostomy, and they were followed up after 1 week, 1 month and 3 months of discharge from the hospital. Nine patients (six males and three females, with a mean age of 24.5 years) with intravesical foreign bodies were admitted during the study period. All of them presented within 1-6 days of introduction of the foreign bodies into the urinary bladder. In all the female patients, the foreign bodies were introduced into the bladder through the urethra as an act of masturbation to get sexual gratification and all were metallic in nature. In two cases, it was a metallic hair clip. In another one case, it was a safety pin [Figure 1]. All the female patients were habituated to such act of masturbation for a long time. All of them sought medical assistance themselves with no clinical symptoms. The foreign bodies were removed successfully during cystoscopy. Figure 1: Cystoscopic image showing the safety pin within the urinary bladder. An electric wire was found inside the bladder in a 23-year-old male patient, which was in­troduced by the patient himself through the ure­thra during an act of masturbation. He presen­ted with mild hematuria, lower abdominal pain, frequency and difficulty in micturition. It was also removed through the cystoscope, and pain, difficulty in micturition, and hematuria subsi­ded after removal of the foreign body. A cut end of a Foley's catheter was found in­side the bladder in three male patients [Table 1]. All of them were referred to our hospital from the peripheral health centers where the stems of the catheters were cut with a blade by the para­medical staffs in an attempt to remove it after the failure to deflate the catheter balloon while catheter removal. After cutting the stem of the Foley's catheter at the level of the external meatus, the remaining proximal part of the catheter within the penile urethra and bladder suddenly slipped back inside the bladder. In all cases, it was removed through the cystoscope after punc­turing the balloon with a Collin's knife. Table 1: Types of foreign bodies in the study patients. One adult male patient presented with supra­pubic pain, recurrent fever, frequency of mictu­rition, urgency for about 2 months. He under­went left-sided pyelolithotomy with JJ stenting, 5 months earlier in a local hospital. After 2 months of the operation, the JJ stent was re­moved there. On USG of the abdomen, one end of JJ stent covered by stone formation within the bladder lumen was detected. 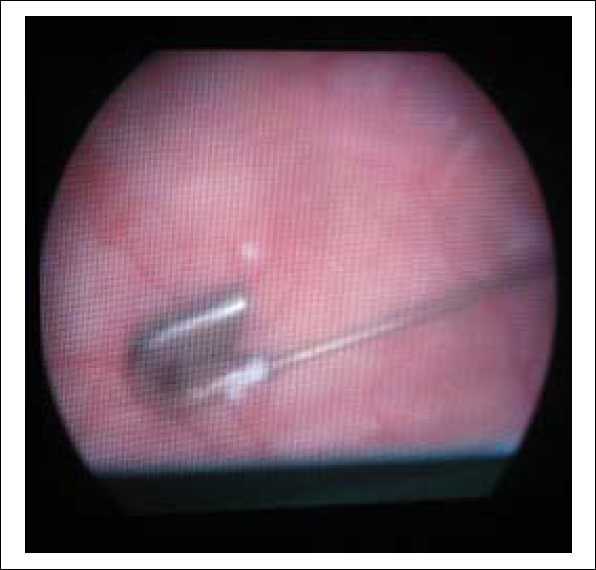 The patient un­derwent cystoscopy under spinal anesthesia. Bladder mucosa was congested, and coiled end of JJ stent covered with multiple small stones found inside the bladder lumen. The fragment of JJ stent covered with the calculi was re­moved through the cystoscope with the help of a forceps. Leech was found inside the bladder in a 16­year-old boy following accidental migration through the urethra, while working in the water­logged paddy field. He presented with lower abdominal pain and profuse hematuria. On cys­toscopy, urinary bladder was full of blood clots. After clot evacuation, the large and swollen leech was found inside the bladder and cystos­copic removal could not be done. The urinary bladder was catheterized and filled with 100 mL normal saline. The catheter was clamped for 1 hour followed by catheter removal expecting spontaneous expulsion of the leech per urethra. But hematuria persisted for more than 6 hours with worsening of abdominal pain. Eventually, a suprapubic cystostomy was performed to remove the leech. In our study, foreign bodies were introduced into the bladder by the patients themselves in four cases; three of them were females. All of them had done it as an act of sexual pleasure. Psychiatric disorder has been reported to be common in patients who used to introduce fo­reign bodies inside their bladders as an act of sexual gratification, and psychiatric evaluation of all such patients has been recommended. Psychiatric evaluation was done in such pa­tients in our study, but no psychiatric disorder was diagnosed. In another four cases, the cause of intravesical foreign bodies was iatrogenic. In the case of the leech that accidentally mig­rated through the urethra, the intravesical nor­mal saline instillation failed to extrude it despite the success previously reported in such cases,  which may be due to the larger size of the leech and the profuse blood clot inside the bladder. Cystoscopically, intravesical foreign body was detected in all the cases. Cystoscopic removal with a forceps is usually enough, but when cys­toscopic removal is not possible, open supra­pubic cystostomy is required for its removal. We conclude that intravesical foreign bodies are not a rare entity. They may be introduced into the bladder by the patient or may be iatro­genic or due to accidental migration through the urethra. Cystoscopic removal is usually success­ful removing most of the foreign bodies from the bladder; but when it fails, then supra-pubic cystostomy is the alternative procedure. 1. Eckford SD, Persad RA, Brewster SF, Gingel JC. Intravesical foreign bodies: Five-year review. Br J Urol 1992;69:41-5. 2. Barks EB, Ramani A, Monga M. Intravesical weck clip migration after laparoscopic radical prostatectomy. Urology 2008;71(2):351-3. 3. Mustafa M. Erosion of intra uterine contra­ceptive device through the bladder wall causing calculus. Urol Int 2009;82(3):370-1. 4. Singh I. Intravesical Cu-T emigration: an aty­pical and infrequent cause of vesical calculi. Int Urol Nephrol 2007;39(2):457-9. 5. Gogus C, Kilic O, Haliloglu A, Gogus O. A very unusual foreign body in a male. Int Urol Nephrol 2002;34(2):203-4. 6. Pal DK, Bag AK. Intravesical foreign body in urinary bladder. Int Braz J Urol 2005;31:471-4. 7. Alam S, Das Choudhary MK, Islam K. Leech in urinary bladder causing hematuria. J Pediatr Urol 2008;4(1):70-3. 8. Deka PM, Rajeev TP. Unusual cause of hema­turia. Urol Int 2001;66:41-2. 9. Jacobs BL, Matoka DJ, Maranchie JK. Renal insufficiency secondary to delayed presentation of a retained foreign body. Can J Urol 2009; 16(3):4697-700. 10. Wyatt J, Hammontree LN. Use of Holmium: YAG laser to facilitate removal of intravesical foreign bodies. J Endourol 2006;20(9):672-4. Jang, H.A. and Kang, S.G. and Ko, Y.H. and Kang, S.H. and Cheon, J. and Kim, J.J. and Lee, J.G. Banu, T. and Chowdhury, T. and Kabir, M. and Bhuiyan, M.A.H. and Laila, K. and Kabir, N. and Hannan, M.J. and Hoque, M. and Mazumder, S.